A Swedish satellite-borne optical experiment for the study of ultraviolet light from processes on the sun was proposed by the young scientist Jan-Olof Stenflo (1) at the Institute of Astronomy of the University of Lund (AIL) in Southern Sweden. 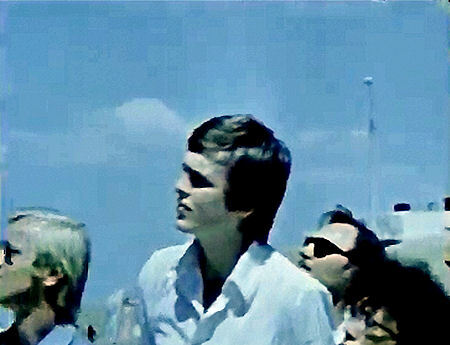 Stenflo's Ph.D. thesis in 1968 treated the Sun's magnetic field and was based on observations made in the mid-60's from the Astrophysical Observatory in the Crimea. 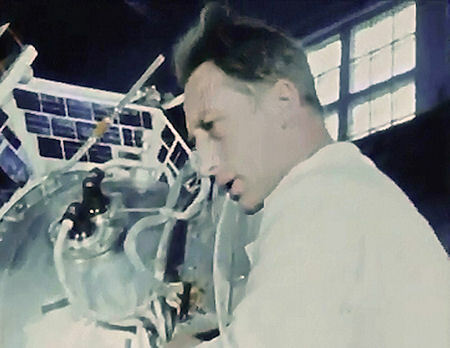 Together with his colleagues in the Crimea he succeeded in convincing Swedish and Soviet space agencies to build this experiment and launch it on a Soviet satellite. The newly-started government-owned Swedish Space Corporation (SSC) got the task to manage the project on behalf of the Swedish Board for Space Activities (nowadays the Swedish National Space Board). The optical parts were built by Jungner Instruments (7) and the encoder electronics by Saab-Scania. SSC built the detector electronics, the sunsensors and carried out the final test of the system in its laboratories at Tritonvägen 27 in Solna, a subsurb of Stockholm. Above left: The whole experiment mounted on the bottom plate of its transport box. 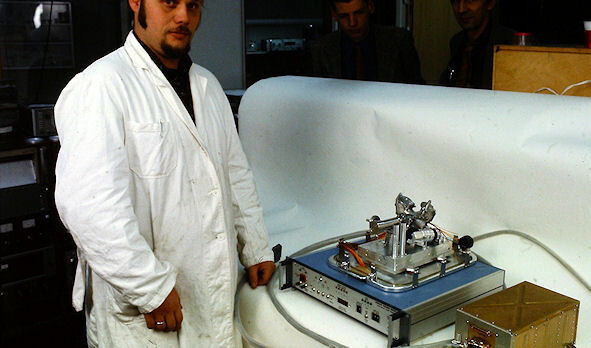 Above right: Lars Stenmark (SSC) with the spectrometer, encoder and support equipment. Left: The experimentet from below. The primary scientific aim of the experiment was to investigate the solar transition zone between the chromosphere and the corona (5) . The registered wavelength region was within the spectral interval 1200 - 1500 Å. The instrument measured the polarization of the sunlight which was used as a diagnostic of the temperature gradient in the transition zone and of the magnetic field. The experiment was designed to record linear polarization in two fixed directions, parallel and perpendicular to the dispersion direction. The main techniques of analyzing linear polarization in the VUV made use of the fact that obliquely reflected light is partially polarized. If the reflection occurs at a dielectric surface at the Brewster angle , the reflected light is 100% linearly polarized, but the reflectivity is low. Certain coatings, like gold, give about 70% polarization at an angle of incidence around 60°, combined with high reflectivity. 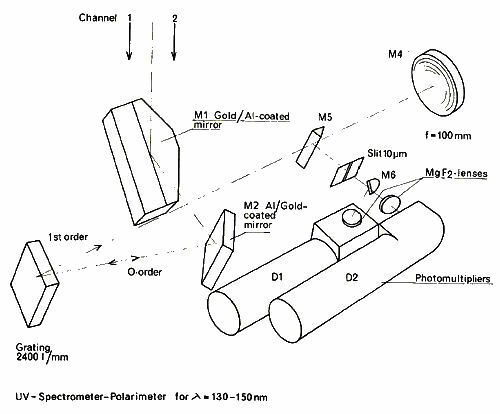 In Stenflo's experiment the polarization analysis took place already at the first two optical components, two plane mirrors divided in two halves with different coatings, gold and Al+MgF2, respectively. The latter coating gives less than about 5% polarization. The two beams reflected at the two different coatings were focused through the same exit slit and were then geometrically separated to feed two separate photomultipliers. These two parallel optical channels responded quite differently to light polarized parallel and perpendicular to the dispersion direction, so the ratio between the count rates of the two channels contained information on the amount of linear polarization of the incoming light. The polarization characteristics of the instruent were calibrated at a UV test facility at the Max-Planck Institut für Extraterrestrische Physik in Garching outside Munich. A plane objective grating produced a slitless solar spectrum, with solar images in each emission line superposed on a background smeared-out continuous spectrum. There were no moving parts in the instrument. The slitless spectrum was scanned by a tilting motion of the whole satellite, which was performed on command from a ground station. The effective spatial resolution in one dimension was about 0.5 arc-minute. The photomultipliers with type number PM 426 L had a sideways-looking MgF2 window and were manufactured by the French company R.T.C. (La Radiotechnique-Compelec) . They had a KBr photocathode that made them "blind" to visible sunlight, i.e. to wavelengths longer than 200 nm. French photomultiplers were used because of export license complications in obtaining U.S. photomultipliers. In addition to the photomultiplier signals two sun sensor signals (X- and Y-directions) were tranmistted to the ground (2). The sketch above shows the optical configuration. 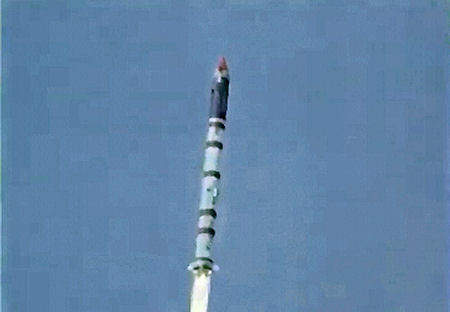 The entire experiment weighed about 6 kg (4) . 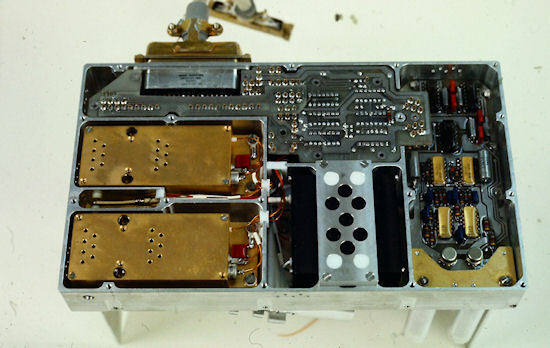 The optics box, which was mounted on the outside of the pressurized body of the satellite, measured 250 x 150 x 180 mm. The encoder, measuring 280 x 158 x 125 mm, was placed inside the the part of the satellite that was pressurized by N2 to 0.87 atm. 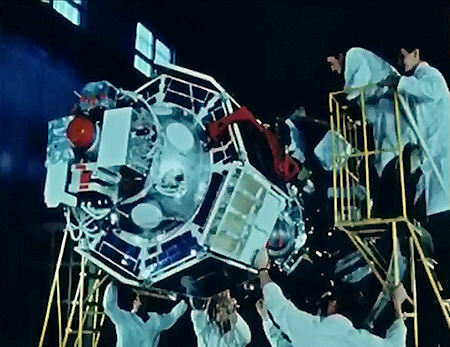 To transmit data to the ground the satellite used four synchronous commutators to which the four outputs from the Swedish encoder were connected. Each measurement value was reconstituted by combining the output from the four commutators. The analog values in the commutator are discretized into 12 levels, the lowest and highest of which are used for synchronization, the other 10 for data. So, the data from the spectrometer was converted by the Swedish encoder into four analog channels each with a voltage in one of 10 levels (1.200-4.800 Volt in 0.400 V steps) and that voltage then represented a decimal value. Level 0 was the decimal digit 0. Level 9 was the decimal digit 9 etc. So, by combining the four digits from the four commutators it was possible to transmit values in the range 0-9999. The encoder also sent a square wave in synchronization with the word rate to a fifth commutator. On the ground the analog output values from the telemetry system were sampled with 8-bit resolution and this binary-coded representation of the voltage levels were recorded on raw data tapes that were sent to the Swedish side. The tape recorder used at the data center in Moscow was loaned to the Soviet side by the Swedish side. 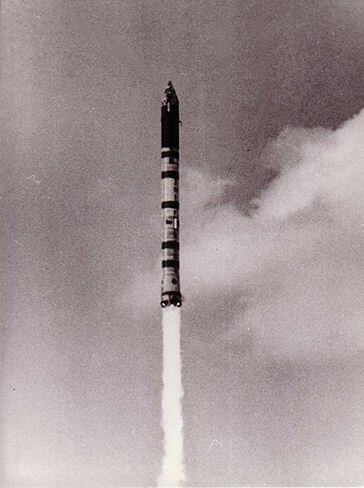 Details of the operation of the experiment in orbit are given in (3) och(5) . As already mentioned the scanning of the spectrum was carried out through controlled scans of the satellite axis along the diagonal of a square having dimensions between +/- 70 arcminutes and +/- 160 arcminutes. During the controlled scan, the angular velocity components parallell to the sides of the square were in the interval 100-250 arcseconds /sec. The roll rate was limited to less than 0.05 deg/sec. The spectrometer worked during two or three ground station contacts per day on average. The spectrometer worked only when the satellite is in radio contact with the ground. Each radio contact was estimated to last from 5 to 10 minutes. It was possible to execute one to three controlled scanning movements during each radio contact. The spectrometer was automatically switched on when radio contact wa s established, and switched off when radio contact was lost. It was foreseen that the spectrometer would be collecting data during between 10 hours and 30 hours during the nominal 60-day lifetime of the satellite. Whenever the spectrometer was operating, 10 Watts of power was available for the experiment. The launch time of the day was chosen with this in mind, obviously. To be able to collect science data the satellite had to be in sunlight when passing the ground station. Let us use the ground station at Yevpatoria as an example. The orbital plane rotated in relation to the inertial coordinate system and therefore also in relation to the sun. This would cause periods when the passes over the Soviet Union would occur in darkness. The table above left shows the number of passes over Yevpatoria in sunlight. Of course other stations could have supported the mission, but nevertheless there were some periods when no data could be collected. 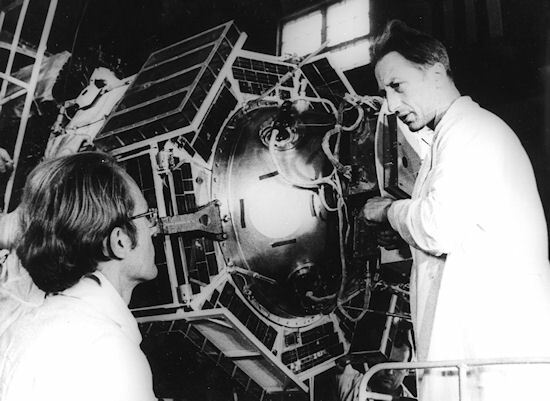 Interkosmos-16 was based on the standardized small satellite design in the DS-series (DS= 'DnepropetrovskSputnik') developed by Mikhail Yangel's design bureau OKB-586 (a.k.a. KB Yuzhnoye) in the Ukraine. These satellites were launched by rockets from the same organization. The satellites were used for a wide range of military and civilian purposes. The text here is based on (6) . DS-U4: Stabilized with a recoverable capsule. Cancelled 1965, never flown. DS-U5: Stabilized with propulsion for orbit corrections. Cancelled 1965, never flown. 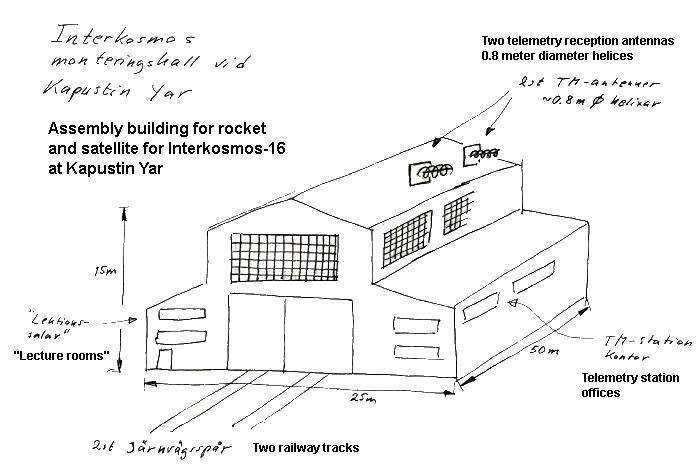 Interkosmos-16 was a DS-U3 vehicle with the suffix "IK" for Interkosmos. Six such satellites were built. 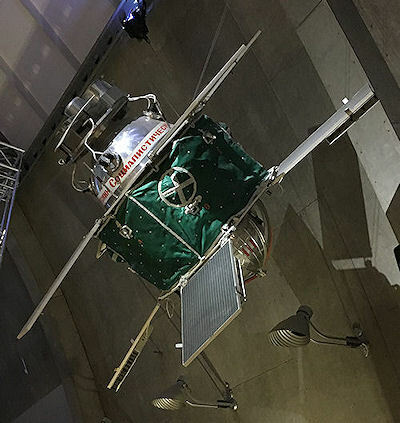 The picture above shows a full-scale replica of a DS-U3 satellite on display at the Science Museum in Stockholm. 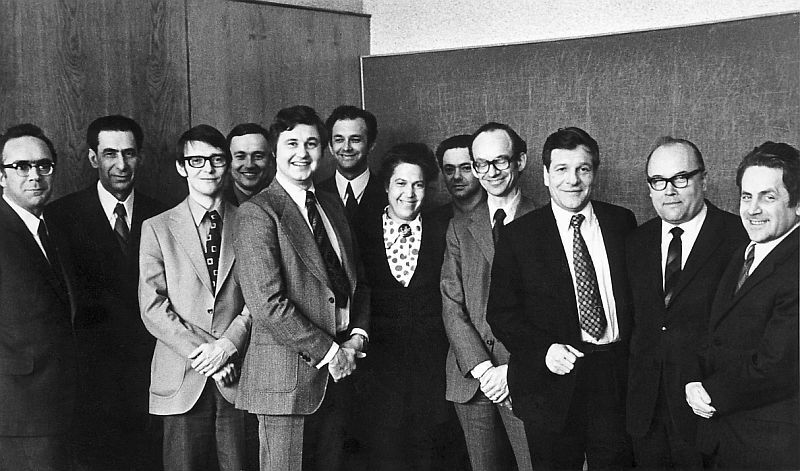 The black-and-white picture below was taken in December 1972 and shows participants in a meeting in Moscow about the project. The Space Research Institute (IKI) in Moscow was represented as well as the research institute IZMIRAN outside Moscow. 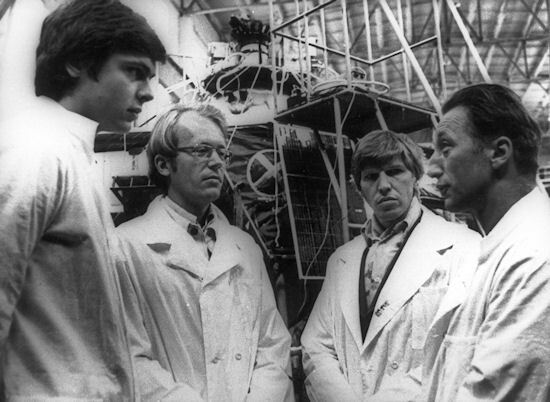 Left to right: Unknown, Yan L. Ziman (IKI), Stefan Zenker (project manager for the experiment at SSC), unknown, Fredrik Engström (CEO of SSC), Yuri Preobrazhenskiy (IKI), Unknown (interpreter? ), Yuri I. Galperin (IKI), Jan Stiernstedt (chairman of the Swedish Board for Space Activities), Valeriy Zolotukhin (deputy head of IKI), Nikolay Novikov (Vice-president of the Intercosmos Council), Igor S. Zhulin (IZMIRAN). The picture has been provided by Mr Stefan Zenker who found it in his archive by pure chance in early 2016. It had probably been sent to him by Andrey Bruns at the Crimean Astrophysical Observatory. The colour picture below it was taken by SSC engineer Lars Anderson in December 1972 when the Swedish side of the project visited Moscow and the Crimea. 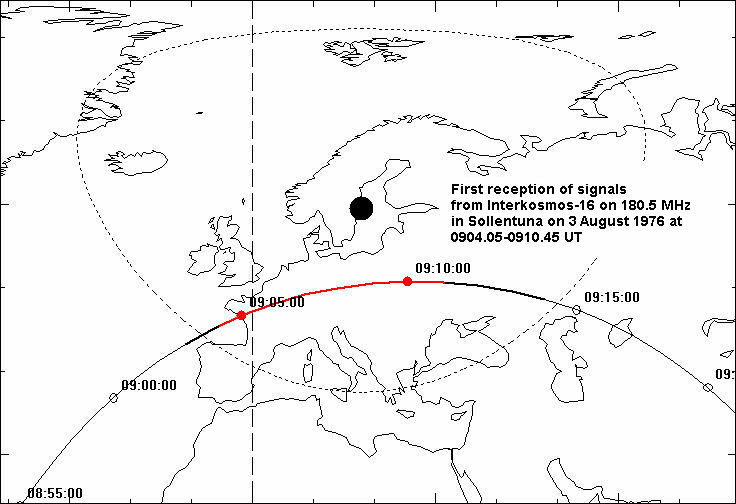 The instrument was launched from Kapustin Yar on June 3, 1975, but a telex message from the Intercosmos council informed the Swedish side that the launch had failed when the first stage of the rocket stopped working 84 seonds after launch. There were no Swedes present at the launch. 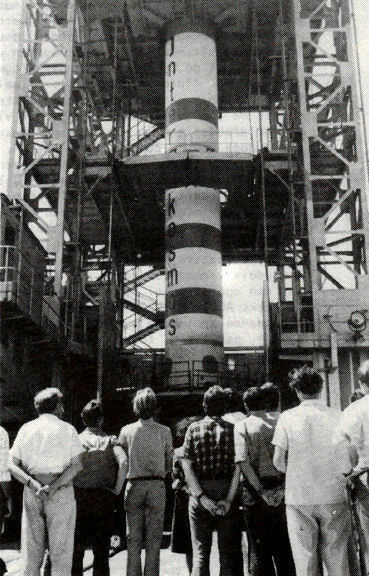 A spare copy of the experiment was prepared and at 1200:02 UT on 27 July 1976 the 435 kg heavy Interkosmos-16 was launched by a Kosmos-3M rocket from "Launch Complex 107/2" at Kapustin Yar (48.5617 N 46.2949 E). 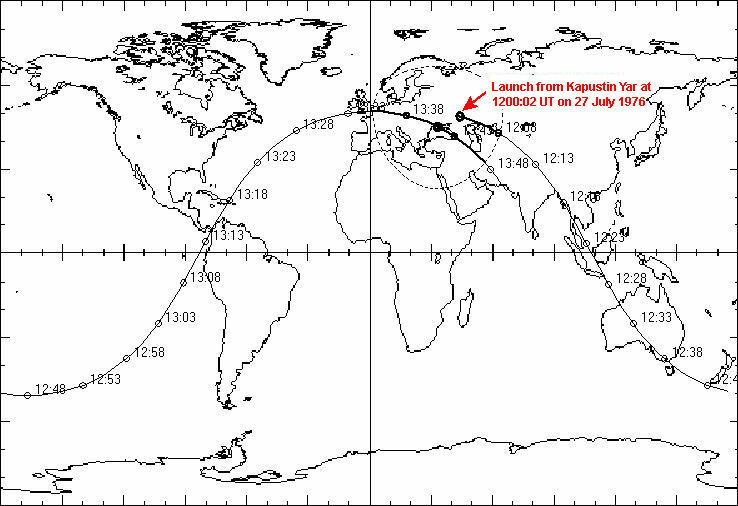 The satellite entered an orbit with initial elements: 464.2-518.5 km, inclination 50.6° and a period of 94.38 minutes. 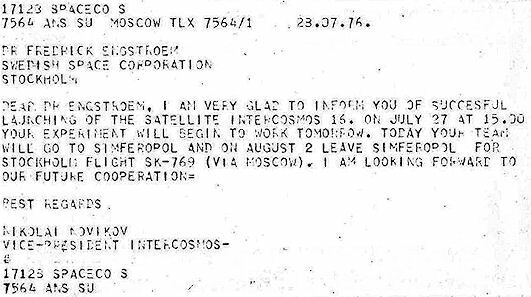 Below two telex messages about the successful launch are reproduced. This time Jan-Olof Stenflo (AIL) and two engineers from SSC (Anders Björkman and Pierre Lingheim) were present at the launch site. Below are the offical Soviet still pictures from preparations at the launch site. Above left. : Pierre Lingheim (SSC) working on the experiment on the satellite. 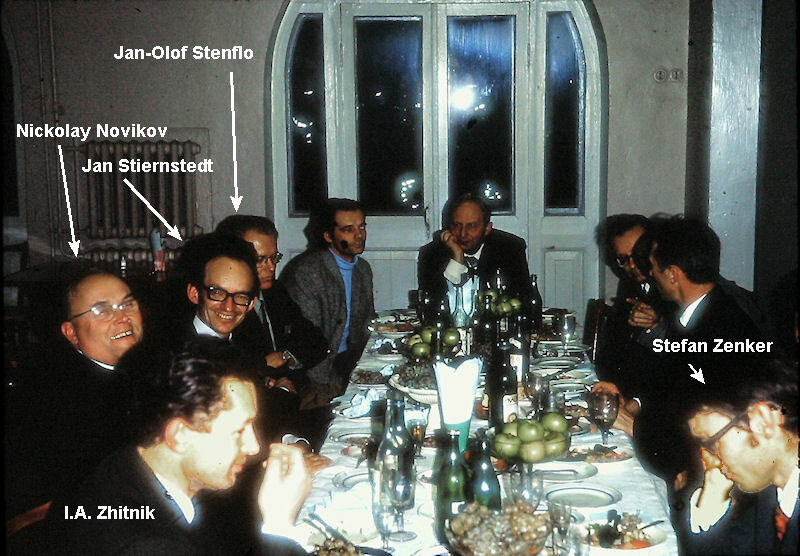 Above right: Jan-Olof Stenflo (AIL), Andrey Bruns (Crimean Astrophyscial Observatory). Left: P Lingheim, J-O Stenflo, Anders Björkman (SSC), A Bruns. I found the picture below many years ago in the Dutch magazine Spaceview. 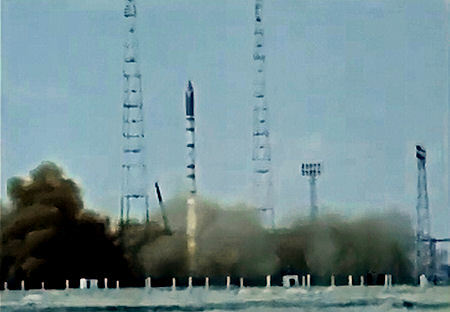 It shows the Kosmos-3M-rocket in the service tower. Jan-Olof Stenflo is the third from the left. This is the first orbit around the Earth. The satellite passed straight over a ground station in the Crimea (Yevpatoria). The pictures below come from this clip. When my colleagues att SSC, Björkman and Lingheim, returned from the Soviet Union I interviewed them about their impressions of Kapustin Yar. We looked at a rather bad Landsat picture of Kapustin Yar and they drew this sketch from that picture: 1.Range commander's residence, 2. 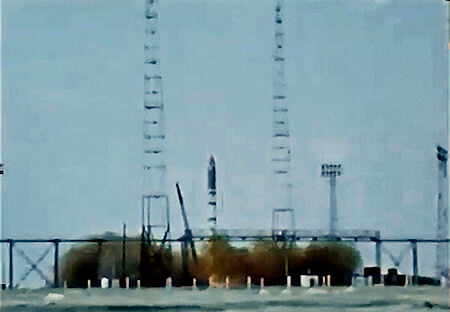 V-2 monument (in memory of first launch 13 october 1947), 3. Shortwave antenna "farm", 4. Radar station (? ), 5. and 6. Radar or telemetry stations in radomes, 7. Assembly hall for the Interkosmos-16 launch vehicle plus dining hall, 8. Launch viewing area, 9. Launch pad with "green" rocket, 10. 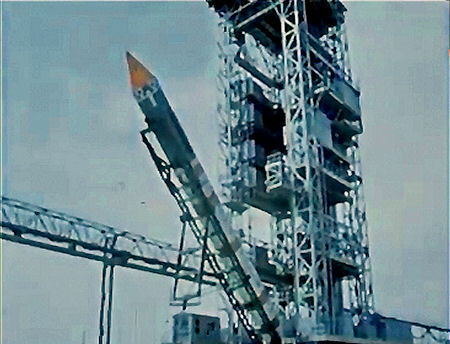 Interkosmos launch complex, 11. Entry guard house. Based on what they told me I also drew this sketch of the assembly hall. Directly after the launch of Interkosmos-16 I wanted to pick up signals from the satellite. As soon as I received reliable orbital data on Xerox paper by snail-mail from NASA (took five days across the Atlantic) I started to search and promptly found signals on 180.5 on 3 August 1976. The signal type was the typical Soviet PPM-AM-format. 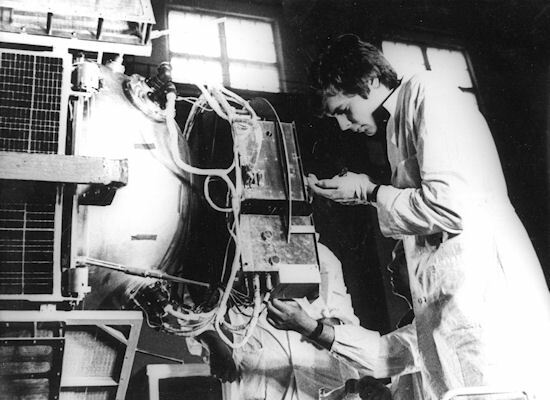 Data from the experiment were received until the satellite stopped operating on 13 November 1976. 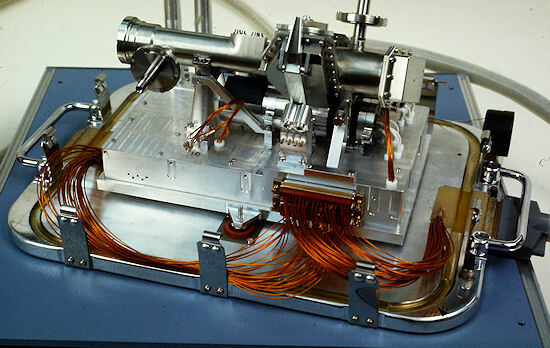 In (4) it is explained that as the instrument efficiency degraded with time, presumably due to contamination, only data from first 12 days in orbit were used for a detailed polarization analysis. 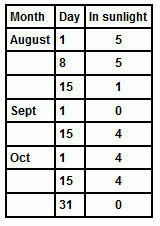 Even during these first 12 days, the average count rates were considerably lower than could be expected for the type of coatings and reflection angles used. For this reason it was only possible to determine a quite high upper limit to the limb polarization in the case of the lines Si IV 139.38 nm, O I 130.60 nm, and the C II doublet at 133.5 nm. This limit is of the order of 10% for all of these lines. The situation is different for Lyman-alpha. Due to the much higher count rates and smaller overlapping effects, it was possible to determine that the polarization at Lyman-alpha to be <1%. Born 1942. Professor in astronomy at the university of Zürich since 1980. Member of the Royal Swedish Academy of Sciences since 1984. 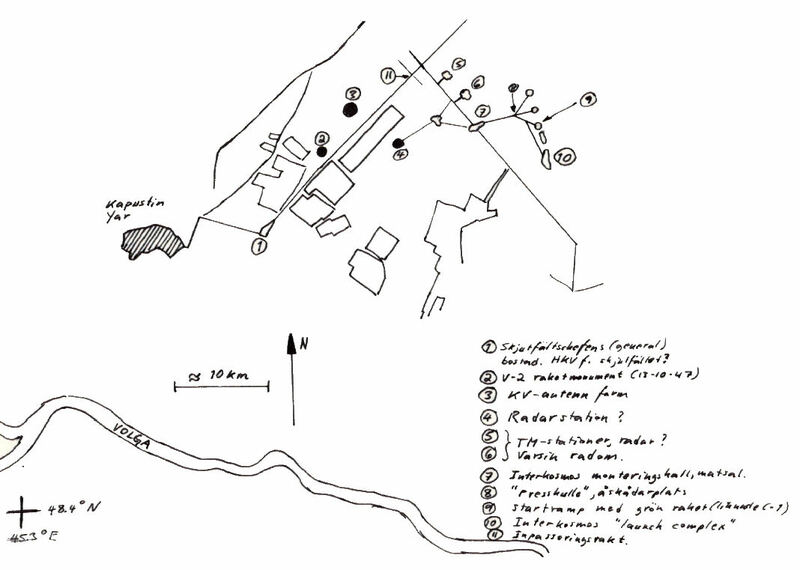 Translation of Interkosmosdata from Russian telemetry tapes. A first outline. (In Swedish). Jan-Olof Stenflo, 21 February 1974. 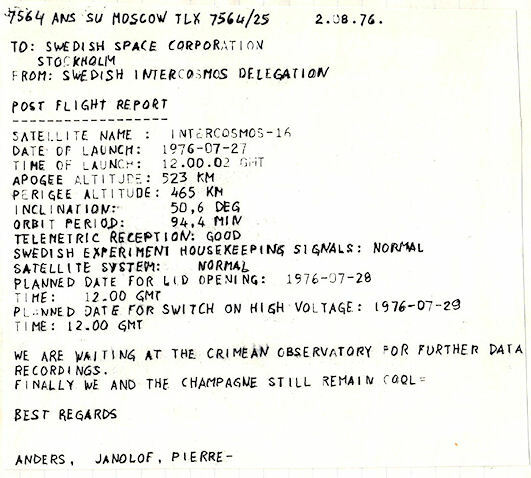 Protocol from the Swedish-Russian Interkosmos meeting in Stockholm 4 - 13 September 1972, dated 14 September 1972. Stenflo, J-O et al, Search for spectral line polarization in the solar vacuum ultraviolet, Solar Physics 66 (1980) pp 13-19. Stenflo J-O, Biverot H, Stenmark L, Ultraviolet polarimeter to record resonance-line polarization in the solar spectrum around 130-150 nm, Applied Optics, Vol 15, p 1188, May 1976. Jungner Instruments was sold to Bofors in 1977.